The best beaches in Thailand are touristy but we were still hoping to find a couple of small islands without too many people around. We had planned to spend two weeks at the seaside in Thailand between the end of October and the beginning of November. We didn’t book anything in advance because we thought it would be easy to get around. We had to do a lot of research before making a decision on the places to go because of conflicting information about transportation between islands. You’ll need a lot of flexibility to make everything work but all the hustle pays off. In the end, we chose Railay Beach and Ko Lipe. Railay is quiet, there are tourists but mainly young people. Railay Beach is also the name of the main beach, the other is Phra Nang Cave Beach, 10 min walk from the central area. It’s smaller and it’s the main attraction because it’s beautifully nestled in a cave and surrounded by rock formations. Be aware that boats take tourists from Krabi to Railay for day trips in the middle of the morning and it gets crowded. If you want to see it, sunrise is the best time. The rest of the day you can hang out on the main beach and relax. 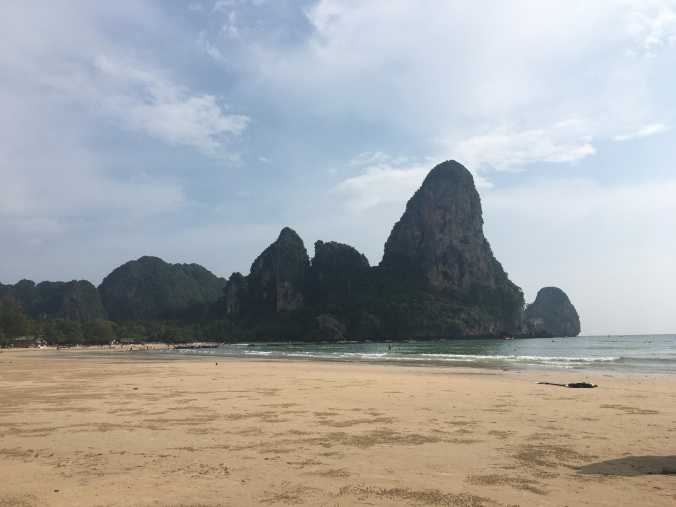 From Bangkok to Railay Beach: take a flight from Bangkok to Krabi then bus to Ao Nang Pier (30 min) and a small boat to Railay Beach (15 min). You will have to walk in the water to reach the boat in low tide so the backpack is advised. Sunrise Tropical Resort spacious and clean room. Good restaurant to hang out if it rains. The best restaurants on Railay are Local Thai Food and Kohinoor Indian. Be aware that food is more expensive compared to Bangkok (a meal can get up to $20 per couple). 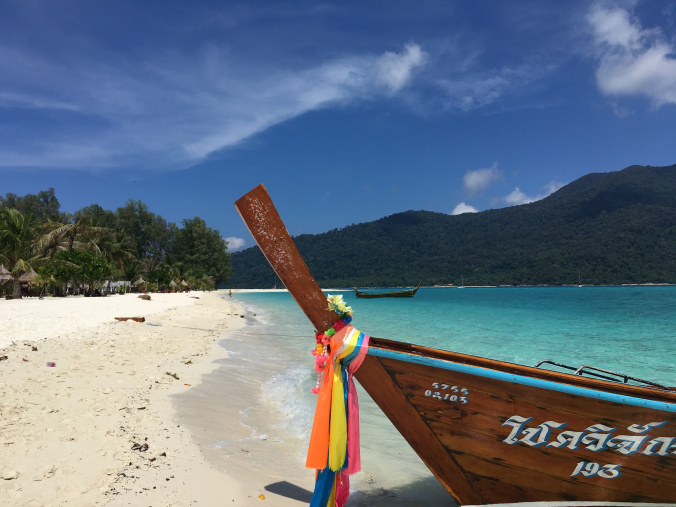 The best beach in Ko Lipe is Sunrise beach, five min walk from the center of the island. The color of the water is unreal: crystalline between green and blue. As the name suggests Sunrise beach is located on the east side and shade comes in the late afternoon. If you want to continue sunbathing and seeing sunset walk on the shore towards the west to the end of the beach. When you turn the corner you’ll see the sun going down. There are plenty of cafes on the beach to enjoy lunch with ocean view, my favorite is The Elephant Cafe. The central street is full of restaurants for dinner (Thai, Indian, Mexican). I don’t have a specific recommendation, they are all good and worth trying. What I can tell you is that when you take the first bite you will taste the delicious freshness of the ingredients. High season in Ko Lipe starts around November 11th. If you go before you might find a bit of rain. Some companies don’t offer transportation before this date. The ones that do offer a package. We used Arunsiri Travel from Railay you will take a minivan to Pak Bara Pier (4 hours) then boat to Ko Lipe - Pattaya (1 hour 30 min). If you come from Bangkok take a flight to Tran then minivan to Pak Bara Pier. Be aware that the boat travels fast and may jump a bit depending on water conditions. If you think you can’t handle the movement take a motion sickness pill. At the arrival at Pattaya, you will stop on a floating pier and see locals holding signs with different hotel names. Inquire with your hotel in advance to know if someone will be waiting for you. Find the name you’re looking for and the person will direct you to a smaller boat that will take you to the shore. Harmony Bed & Bakery cheap option compared to the bungalows. Not impressed with service and cleanness. Good value. All the restaurants in that street are great. It’s not easy to find secluded beaches in Thailand but I would definitely recommend both Railay and Ko Lipe because you will enjoy a bit more privacy and certainly an unforgettable scenery.